Which should you purchase? An electric snow blower (snow thrower) or a gas snow blower? There are advantages and disadvantages to both and good reasons to buy each one under specific conditions. For example if you have a small driveway and do not get a lot of snow each year, an electric snow blower might be the right solution for you. On the other hand if you have a long driveway with lots of snow , chances are you are going to need a lot more power to blow that snow further away and clear it quickly. 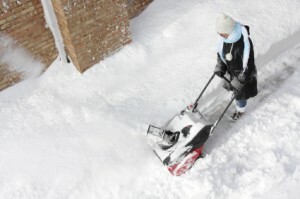 We have listed a few of the pros and cons of electric snow blowers vs. gas powered snow blowers. It really comes down to what your personal situation is in terms of how much snow you have to clear, how long your driveway is and where can you store the machine during the fall, spring and summer periods. If you get more than 6 inches of snow at one time, and you are using an electric snow blower you may have to clear some with a shovel. This amount of snow may be just too much for an electric snow blower. They are not as powerful as gas snow blowers and cannot deal with ice or crusty snow that sometimes occurs during mild winters when you get a sudden freezing of the snow. Heavy wet snow can become pretty tough to clear unless you have a heavy machine that can cut through the drifts, the slush and the crusty snow conditions that occur from time to time. Wet snow becomes very heavy and unless you have a powerful snow blower, the machine will not be able to throw the wet snow very far. Electric snow blowers can be a cheaper alternative than gas models, however if they cannot do the job then you have just wasted your money. Most consumers want to have a powerful enough machine that will clear snow easily and make the job easy enough that you can clear the snow in ten minutes or less regardless of how deep those drifts are. 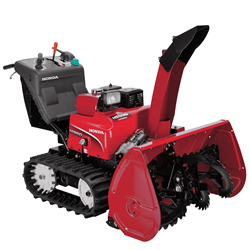 On cold days or in blowing snow, the last thing you want to do is be out in the snow trying to clear the driveway with a machine that does not work well and you have to struggle with it. A 10 minute job turns into a 30 minute job, your cold and wet and your late for work. We think most consumers will want to invest in a strong powerful snow blower that will clear the snow quickly and avoid all this unnecessary frustration. Spend a little more money and purchase one that will do the job quickly and easily. This is our first review of a Hybrid snow blower and it also happens to be the first from Honda which is also a first on this web site. We plan to review many more of the Honda machines this quarter, so stay tuned. Back to the Honda hybrid snow blower model HS1336iAS. Most snow blowers have a single four stroke engine that powers the auger which grinds the snow and breaks it up, the impeller which ejects or throws the snow into the air and also the drive train which moves your snow blower forward. Not so with the new Honda Hybrid Snow Blower HS1336iAS. This Honda hybrid snow blower uses electricity to power two electric motors to propel the machine forward or backwards. The engine generates electricity and charges two on board batteries which in turn provides power to the electrical motors which rive the machine forward or backwards. It is a hybrid snow blower for this reason. Aside from the fact this is one of the larger snow throwers, they claim that this machine will run quieter and smoother, be more efficient on fuel and contribute less pollution to the environment. It is controlled by an intelligent system that apparently delivers a 19% improvement in the fuel economy area. We cannot support or detract from these claims since this is a brand new machine to the North American market and only time will tell as to it’s improvements and reliability. We did see prices of $7999, which is certainly up there for a snow thrower. Do you really need this hybrid technology in a snow blower? Also we wonder about all of the added technology and how long it will last under harsh conditions. Some snow blowers stand up very well, however you only know that once it has been tested by a North American winter. Transmission: Two parallel electric motors control the track drive forward and reverse propulsion. Self-propelled, infinitely variable electric drive. Track drive provides excellent traction. Aside from this particular snow blower being a hybrid machine, it does come with a lot of features that may appeal to many buyers. These are listed above, however several notable features are the drive by wire approach which means it takes no more effort to steer this machine than pressing a button. It is also electric start, so no tugging on a pull chord and it clears 36 inches of snow width at a time. This is a large powerful machine with excellent traction, clearing width and snow throwing distance of up to 62 feet, which is huge for this size of machine. If you have a large area, you will appreciate the speed at which you get the job done with this machine. The information we read indicates that there are electronic indicators to keep you posted on various components. However they did not indicate what these were. We assume electrical generation, battery charging, engine speed, perhaps oil pressure, however we have no information on these areas. This is a new machine to this market. W would really appreciate your comments from people who have purchased this machine. Having used a snow blower myself of a smaller size, I can appreciate how controlling this machine using buttons rather than leavers and manual strength will be a huge improvement. For information about delivery methods for your snow blower, accessories that you can purchase, safety rules to follow, proper operation and maintenance information, go to our page General Snow Blower Information, to read more about these topics.